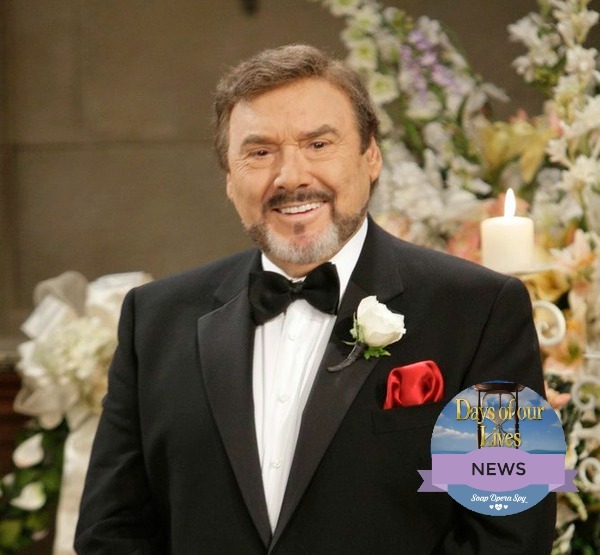 ‘Days of Our Lives’ (DOOL) news indicates that even the Stefano DiMera [Joseph Mascolo] has beaten the odds before, this time it looks like “The Phoenix” won’t rise from the ashes. Mascolo’s costars confirmed the actor’s final exit on social media, to great disappointment from fans. Few expected when Hope Brady [Kristian Alfonso] shot rival Stefano last week that final death would be the outcome. After all, how many times has Stefano cheated death? He’s been drowned, shot (more than once), burned (more than once), bombed, caught in a hurricane, plus a plane and car crash. Fan response has been even greater than that of coworkers – many lamenting that the Phoenix was gone for good – with some frustrated at the manner of his death. Looks like everyone is sad to see the legend go, but Mascolo’s health concerns may have forced a hasty exit for his character. When Mascolo negotiated his last contract renewal, he insisted on a maximum of two days of work per week which resulted in much less screen time than fans would have preferred. But now, all signs point to a permanent exit from Salem for Joe Mascolo – and Stefano DiMera. What do you think DOOL fans? Will Salem be the same without the evil Stefano? How much will you miss Joseph Mascolo? Share your thoughts in the comments below and be sure to check back with Soap Opera Spy often for more “Days of Our Lives” spoilers, news and updates. Rachel is a General Hospital aficionado who is so dedicated to the populace of Port Charles that she scheduled her college class schedule around the show. Rachel loves writing spoilers, soap plot analysis, and storyline prognostication. When she’s not tuned in to daytime or primetime soaps, Rachel spends time outdoors with her son, husband and beloved retriever. Get Exclusive Joseph Mascolo News & Updates! ‘The Young And The Restless’ Poll: How Do You Think Victor Newman’s Iconic Painting Survived The Tower Fire? Vote Now! I don’t want Stefano (Joseph Mascolo) to leave. Loved his character and his acting as head of the DiMera family. Please don’t write this family out! Even tho I must say he had more than 9 lives..
I’ve watched since the show began, and I have to say that my all-time choice for best actor has always been Joe Mascolo. What a multi-talented gentleman. I saw him in the film “Yes, Giorgio,” which starred Luciano Pavarotti, and he has a great singing voice! What always amazed me was his ability to speak in such a believable accent. In fact, when he was being interviewed as himself rather than Stefano, it bugged me to hear him speak “plain English!” That’s how much he brought his character to life. As others have said, “Well done.” We will miss you terribly. WOW!!!! What a way to go. Gonna’ miss him so much. Have watched Days since day , my Daughter was born 11/65 and I started right after she came home from the hospital. I had the pleasure of meeting Joe a the 45th Anniversary book signing. So sweet waving at his fans and laughing. Not at all like Stefano. His wife was sitting at a table and I went over and told her how much I loved his character, and him. At the time he was married to Kate and I mentioned to Joe how I enjoyed seeing some of the older people having great story lines. God bless you and have a wonderful retirement. We will miss you. Hugs. Joe has been a wonderful addition to Days his parting is bitter sweet but I understand his need for rest. Now how can the dimera family live on to bring excitment back to town…….bring Peter back with a vengeance. Let him reclaim Jennifer as his wife and send him after all who Kirsten hated. As well as Sami for stealing the family fortune. Nikki deserves some happiness give it to her. Those kids that grew up over night dump ciera she is horrivlebring max and Frankie back bring back David, Trisha or just create new exciting characters we can love again. I’m fairly new to Days. I’ve watched for only about 3 years but in that time it was Stephano and the Dimera family who intrigued me and kept me coming back. I’m sad to see Stephano go, especially at the hands of Hope. But he was a legend in his field and he will be greatly missed. Days will never be the same. He’s my favorite actor on the show. I’m just in shock. I’m hoping it was a dream sequence !!!! Hes amazing actor and love how he keeps everyone scared. If he has to go for health reasons then I wish him well and now Andre can be head of the kingdom ! They need then evil family noone wants to just watch the Holy Bradys. The whole storyline needs help , no way would it be possible to steal his money and why doesn’t Belle give it back it’s not hers . Teresa and Brady doesn’t fit at all , it makes him look like a idiot . Can he not learn he falls for the wrong women !!!! Plus no chemistry . I really enjoyed watching him on dools,he’s a great actor,and I will miss him on Dools,I’m and big fan of him,and I’m sorry to see him go.Take care of yourself. Good luck. I hate to see Joseph Mascoco leave the show, he is a great actor, plays a great villan. May God Continue to Bless him in the future. DOOL is losing a lot of character’s. PTER Reckell, AKA BO BRADY, Dr Dan, Kate Mandir AKA Abby, Now Joseph Mascoco AKA Stefeno, I heard Eric is leaving as well as Victor. Three of them so far have been killed off, why kill everyone off, why not let them say they are moving out to another state? Either way all those who I grew up watchin will be missed.I pray that God will continue to BLESS them in there new Chapter in life. Joe Mascolo will greatly be missed. He played “the bad guy” very well. Even folks who don’t watch DOOL know who Stephano DiMera is. Many best wishes to this Days icon! Joseph Mascolo will be great missed. He was the ultimate villain. It’s hard to lose someone who has been around so long. Happy retirement to him. I hate to see him retire, but have noticed he has gone down a good bit. I am glad, though, that they “killed off” the character. He IS the Phoenix, Stephano DiMera. No one could replace him as well as the other long-running actors. I hope his health improves and he enjoys retirement.